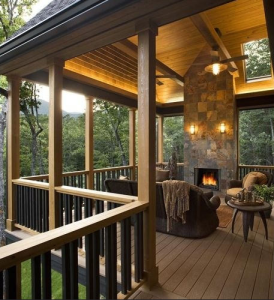 AZEK Decking from United Building Supply Inc.
One of the most inviting elements of any home is the outdoor deck. From hosting parties in the backyard to simply sipping coffee while watching the sunrise on a brisk morning – the deck affords a homeowner extra space without forcing them to incur a dramatic increase in upkeep. The right deck is appealing, physically enduring, and adds to the home in a way that makes one hard-pressed to imagine it any other way! Oftentimes, homeowners have a backyard that is underutilized, and a well-placed deck can open up that space and make it much more highly usable. The truth of the matter is, though, that not all decks are made equally. Wood decks can be stained, rot, and deteriorate over time. 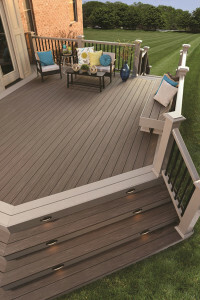 Here at United Building Supply Inc., great decking suppliers are something of a specialty for us. We proudly carry AZEK Products – a brilliant coalition of design and beauty. Their decks are made of the finest materials, and feature the optimum choice of low maintenance decking. Made with a cellular pvc formulation, AZEK decks are stain resistant – helping you avoid the cleanup of spilled wine, fruit punch, and even hamburger grease. This is a revolutionary surface that beats all other decking options, from wood to composite. The true advantage of Azek Decks is in their design. AZEK decks meet the demands of consumers, and then some. Essentially, they eliminate the headaches of traditional wood and composite decking, allowing homeowners to fully enjoy the deck for many years to come. To discover this company’s great products, and find a plethora of other building supplies you need to get the job done, be sure to visit our website and discover for yourself all of the prime outdoor remodeling products we have to offer. Our collection of exterior remodeling products is perfect for contractors and builders alike, and comes at prices you won’t find anywhere else! Give us a call at 920-564-3888 today or visit us online to get started! Many of the outdoor remodeling products we offer here at United Building Supply Inc. serve a practical, useful purpose. Quality siding keeps a sound home structure, great windows keep warmth in, and top notch doors block your home from the elements. But perhaps the most purely aesthetic addition to a home is a deck – be it in the backyard or the front. A deck is, at its essence, a piece of property utilized solely for recreation. The right deck adds to a property without over-encumbering it. Over the years we have solidified relationships with two phenomenal decking companies in Genovations and Azek decking. Through these great suppliers we can provide you with the materials you need to erect a positively awe-inspiring deck. The right deck serves its role at multiple times during the day. A morning coffee while browsing the newspaper, a weekend barbecue block party, or even a twilight get-together can all be accomplished on a cozy, inviting deck. Whether you have a client that knows exactly what kind of deck they are looking for, or a customer that is in need of a little guidance – we at United Building Supply can help you get the job done. For nearly 30 years we have cultivated relationships with some of the best building supply companies in the business, and we are happy to share the rewards of those solid relationships with you. Be sure to take a look around the site and discover all of the various building elements we have to offer: from decking to windows, doors to insulation, we even have soffit, fascia, and trim!